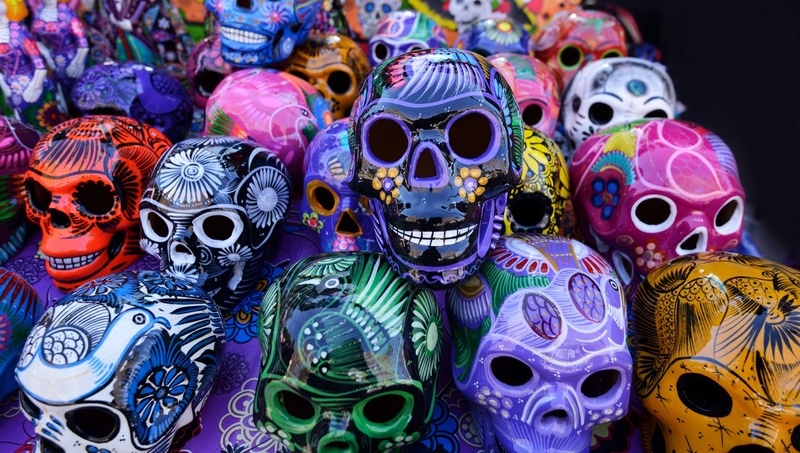 While there are some similarities between Mexico’s Day of the Dead and Halloween, don’t let the skeletons fool you — Día de los Muertos has its own unique history and cultural traditions. For many, it comes as no surprise that the United States has been the top country for Halloween celebrations for decades now — but what about the rest of the world? 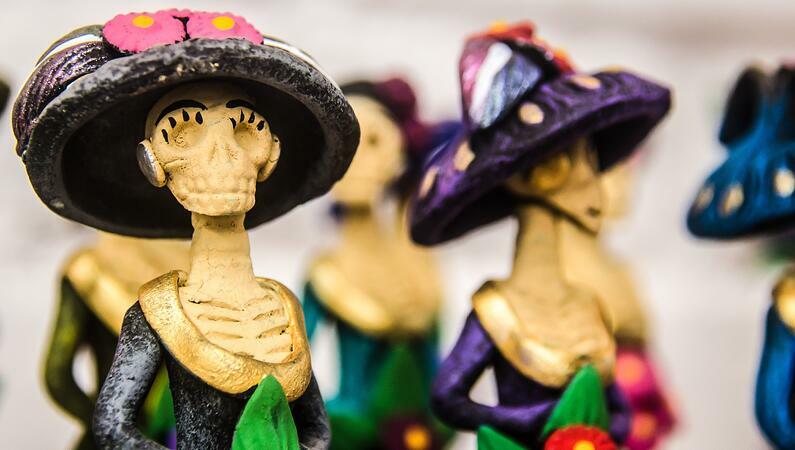 You may have heard of the popular Mexican holiday Día de los Muertos, or Day of the Dead, which bears certain resemblances to North America's Halloween. In fact, many assume they are the same holiday, but the truth is that their origins (and methods of celebration) are actually quite different. It’s commonly believed that Halloween has its roots in Paganism, a religious movement originating from Christian communities in southern Europe. The Celtic festival of Samhain in Ireland, also associated with Pagans, is said to have been the earliest version of modern-day Halloween celebrations. For them, the beginning of November signified not only the Celtic new year, but a time when the boundaries between the living and the dead were blurred. This became the basis for the spooky ghost stories and haunted themes that we associate with Halloween today. Día de los Muertos, on the other hand, is firmly rooted in Mexican indigenous cultures. There is evidence that about 3,000 years ago, these Aztec cultures celebrated specific rituals during the ninth month of their calendar to honor deceased ancestors. They dedicated their rituals to the 'Lady of the Dead,' known today as the infamous La Calavera Catrina. 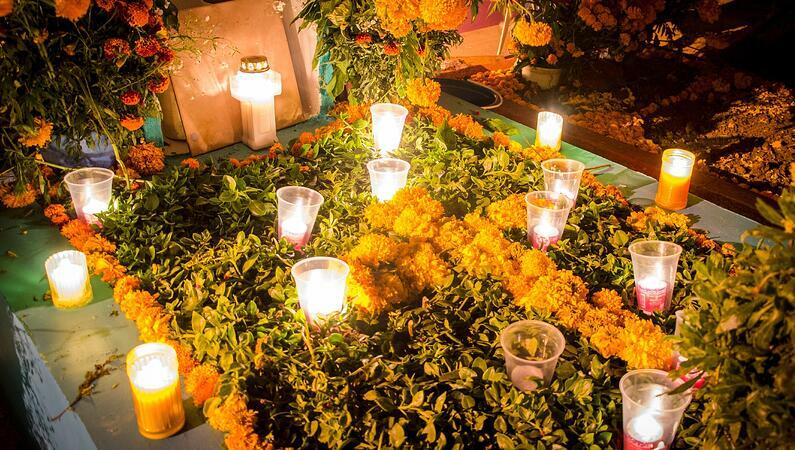 Today, Día de los Muertos is all about celebrating friends and family members who have passed away. It is not a time for sadness or mourning, but rather a time for positive reflection and coming together. If you’ve had the chance to experience any Día de los Muertos celebrations before, you might recognize the photo above. La Calavera Catrina has become the central icon of the festival — millions of Mexicans paint their faces to look like her or wear skull masks called calacas. 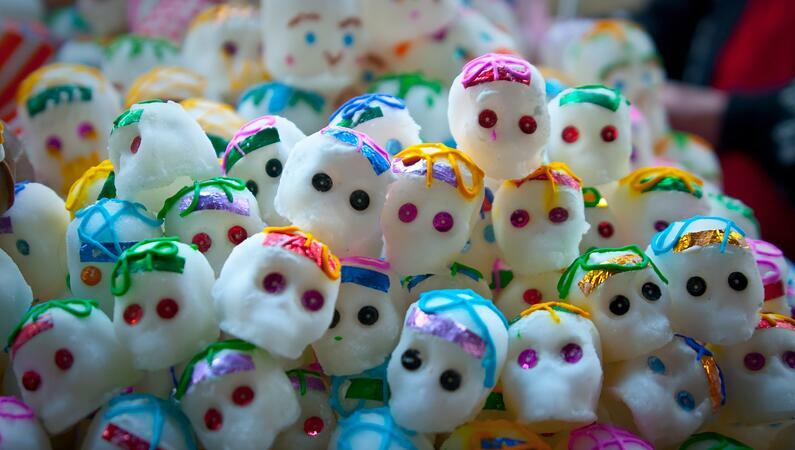 Small, sugary skulls are also given as gifts to friends and family members. 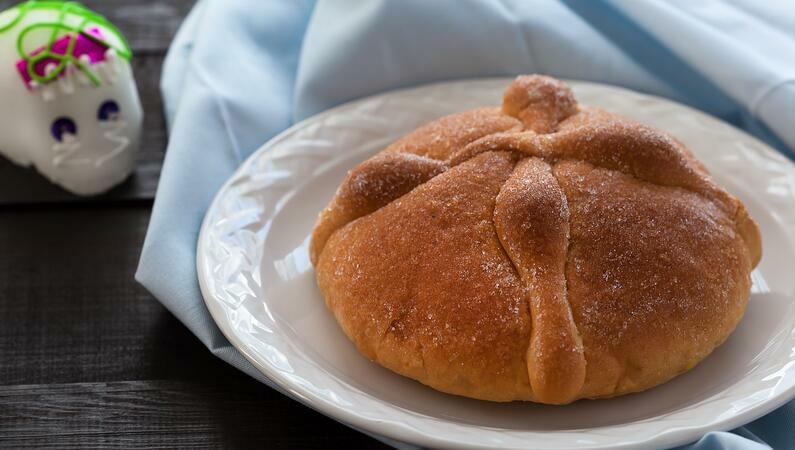 Following the skull theme, pan de muerto is another common treat associated with Día de los Muertos. It’s a decadent coffee cake decorated with meringue to give the impression of skeleton bones. Bonus points for creativity! While skulls are certainly part of Halloween as well, we wouldn’t go so far as to call them the primary symbol of the holiday. Popular Halloween symbols also include pumpkins, ghosts, witches, vampires, and zombies. The majority of these common Halloween symbols are taken from the horror genre, made popular by authors such as Edgar Allan Poe. Many of us are pretty familiar with the activities that take place during Halloween: trick-or-treating, haunted house visits, even lavish costume parties. It’s become much more of a commercialized holiday in recent decades — in fact, it’s the second most commercial holiday in the United States after Christmas. In contrast, Día de los Muertos has maintained much of its original focus on rituals meant to celebrate deceased loved ones, and its customs are therefore slightly different. The Mexican national holiday is celebrated for two days, while we reserve just one day for Halloween. On November 1, Mexicans typically honor children and infants who have passed away, while November 2 is specifically for adults. Family members visit their relatives’ graves armed with handfuls of toys, photos, and orange Mexican marigolds to honor the memory of the deceased. People often wear shells and other noisemakers on their clothing in hopes of waking the dead souls. At home, beautiful altars called ofrendas are decorated with candles, flowers, and large piles of food and drink meant to revive the tired spirits. Deceased adults are even offered shots of tequila or mezcal on the final day. Día de los Muertos and Halloween certainly share many aspects — they are both spiritual in nature, go back thousands of years, and give people an excuse to wear colorful costumes. What’s important to recognize is that each holiday has a distinct cultural significance, and with that comes a variety of fascinating customs and traditions. If you loved getting to know Día de los Muertos as much as we did, click the button below to start learning Latin American Spanish. You’ll master the basics of the language while learning about more Latin American traditions and celebrations through our comprehensive culture notes. Or, choose one of over 70 other language courses to explore. We just learned all about Halloween, Samhain, and Día de los Muertos, but do you know of any similar holidays from other cultures that also blur the boundaries between the living and the dead? Share with us in the comments below!